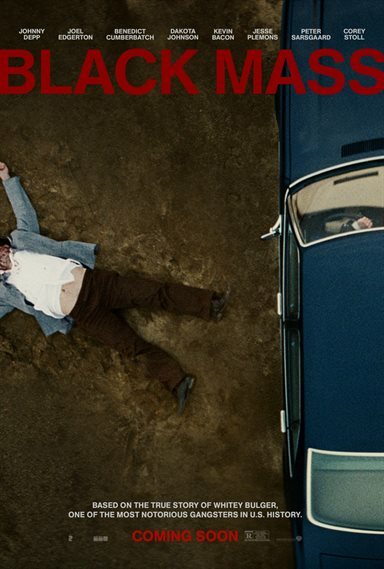 Download Black Mass in Digital HD from the iTunes store. Black Mass images are © Warner Bros.. All Rights Reserved. Jimmy "Whitey" Bulger is a man you did not want to cross. As the notorious head of the Winter Hill gang from Boston's South side, he was responsible for numerous murders and controlled the drug and racketeering trade in the area. He was also allegedly an informant for the FBI for 20 years, handled by his childhood friend, John Connolly. Black Mass, the best selling novel turned movie, details those turbulent years when Bulger gave information to the FBI in order for them to bring down the Italian Mafia in Boston, while conveniently turning a "blind eye" to Bulger's operation. Ultimately, the FBI realized they were being played and honed in to bring down Bulger and his confidantes. With an all-star cast, Black Mass shows signs of promise. Unfortunately, the script and the direction don't live up to the potential. Johnny Depp (Pirates of The Caribbean) transforms into the sociopath, Bulger, with a performance that might get him an Academy nomination (though I don't think he would win). He attempts to make Bulger human by occasionally showing a softer side, but it isn't very convincing, and his shining moments in the movie come when Bulger is most evil and conniving. Benjamin Cumberbatch (The Imitation Game) portrays Bulger's good guy brother, Senator William Bulger and Joel Edgerton (The Great Gatsby) is solid at FBI agent Connolly. Supporting cast members Dakota Johnson (Fifty Shades of Grey), Kevin Bacon (The Following), Jesse Plemons (Breaking Bad), Rory Cochrane (CSI:Miami) and Peter Sarsgaard (The Green Lantern) only add to the excellent performances. Johnson is better than her weepy portrayal of Anastasia Steele and Cochran and Bacon play the stereotypical 1970's FBI Agents to a tee. The problem with the film is the pace. It is entirely too slow and drags at points that should be suspenseful, tense and exciting. Although I know I was watching a fictional drama based on real life events, I feel I would have enjoyed the movie more had I been watching a documentary about Bulger on The History Channel. Perhaps I should have watched the movie as a pure drama and forgotten the fact that it is based on real life events. The sets and costumes are spot on and give the film an authenticity that is excellent and enhances the overall feel of the picture. Along with the actors, they are some of the bright spots, but, in the end, neither can salvage the work. Don't get me wrong, it isn't horrible and I've seen far worse, but I was hoping for more and, in the end, I was disappointed. Black Mass isn't a docudrama, nor is it a "gangster" film; and, as a straightforward drama it just isn't all that strong.